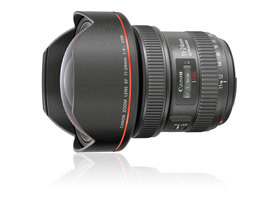 Aimed predominantly at architecture and landscape photographers, the Canon EF 11-24mm f4L IS USM is a completely new addition to the full-frame EF lineup and boasts the widest angle of view of any rectilinear lens in production — a rather extreme horizontal 117 degrees (126 degrees diagonal). That’s considerably more extreme than the 104 degrees (114 degrees diagonal) of the Nikon AF-S Nikkor 14-24mm f2.8, and comfortably wider than the previous wide-angle champ, the Sigma 12-24mm f4.5-5.6 DG HSM II at 112.6 degrees (122 degrees diagonal). For history buffs, both the Sigma and now the Canon are wider than Nikon’s legendary AI and AIS Nikkor 13mm f5.6 models from the 70s and 80s. With a horizontal angle of view of 108.3 degrees (118-degrees diagonal), that lens was built-to-order only and was one of the most expensive models in the range at around $10,000 (USD) in 1989, around the time Canon introduced the original EOS-1. The new Canon’s optical design consists of 16 elements in 11 groups, along with four aspherical lenses to correct for distortion, including the world’s largest-diameter ground lens (the other three are precision molded), and UD and Super UD glass to help reduce color blurring. The zoom also adopts two Sub-Wavelength Coatings, and one Air Sphere Coating, both of which use nano tech to reduce flare and ghosting, while additional fluorine coatings help prevent marking on the front and rear elements. The lens is also weather-sealed around the mount, switch panel, and the two collars, although there’s no mention of the front focus mechanism. The new model focuses to 11.02″ (28 cm) at 24mm, measures 4.3 x 5.2″ (109 x 132mm), and weighs 2.6 lb (1180 g). It is available now at around $2,200 (USD). 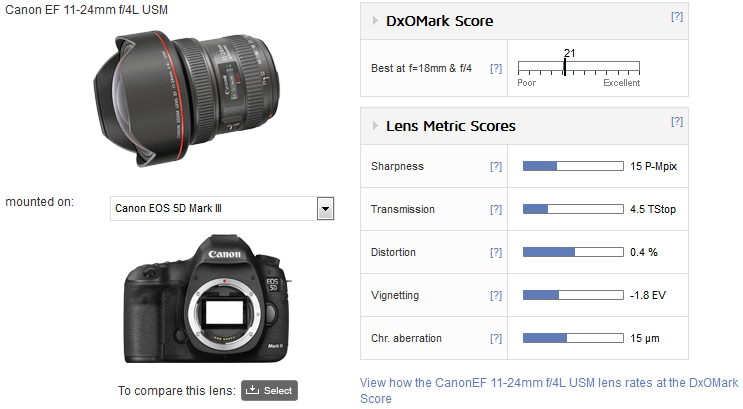 Achieving an overall DxOMark score of 21 points on the full-frame 22-Mpix EOS 5D Mk III, the EF11-24mm f4L USM is an extremely high-performance lens. Considering this is a zoom, the new model has very high levels of sharpness across the field, although predictably it has higher sharpness in the centers than at the edges. This is a consequence of some slight field curvature, the former being most noticeable at either end of the zoom range while the latter is more of an issue at the wider-end. It makes for a rather complex signature, but given the extreme nature of this lens, it is outstanding optically. Across the range of focal lengths it gives sharp images from the initial aperture, and while only moderate in speed, the T4.3-4.6 transmission and relatively low vignetting results in an entirely usable maximum aperture. Stopping down does little to improve sharpness, although there are some gains in the outer field. Perhaps the most impressive aspect, though, is the control of distortion. Canon has clearly gone to great lengths to keep this to reasonable levels. 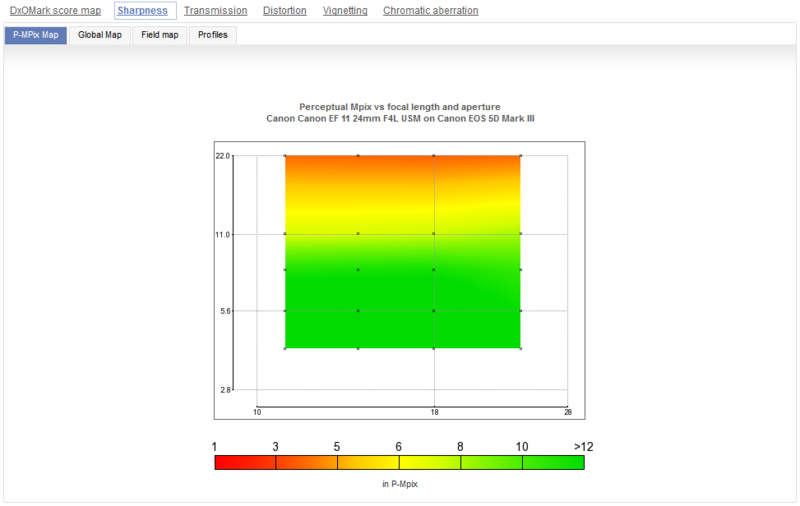 There’s some simple barrel distortion at 11 mm, but it’s very low. Of course the rectilinear design means that subjects at the sides of the frame become stretched at 11 mm, but at least this lens doesn’t display the more difficult to correct complex-type (moustache) distortion that’s often found in ultra-wides, and distortion is practically non-existent at the longer focal lengths. 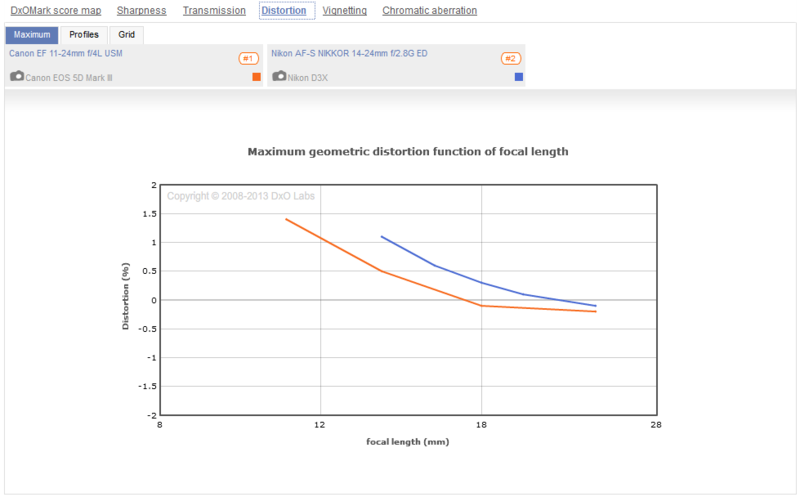 However, there is some chromatic aberration at the periphery, although the effects are reduced on stopping down. 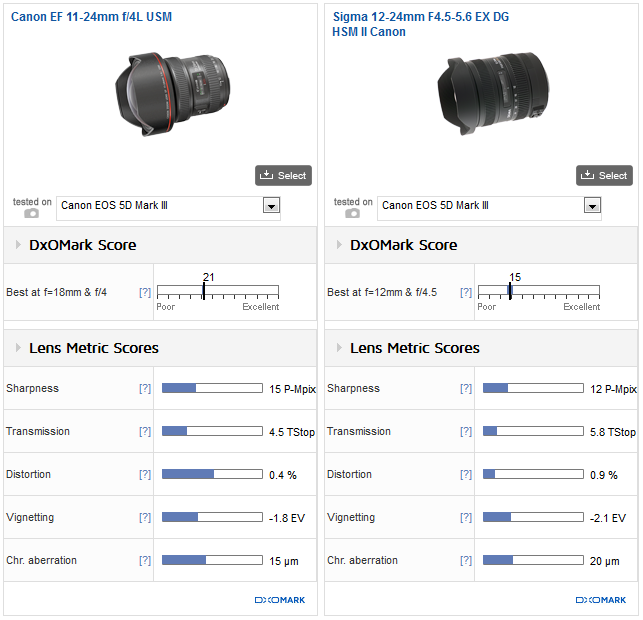 Compared with the latest version of the Sigma 12-24mm f4.5-5.6 on the Canon EOS 5D Mk III, the Canon is quite clearly a much stronger performer throughout the zoom range. Centrally the Sigma isn’t bad, but its sharpness can’t match the Canon’s on the borders at the wider end, and it’s weaker across the entire field at 24mm. 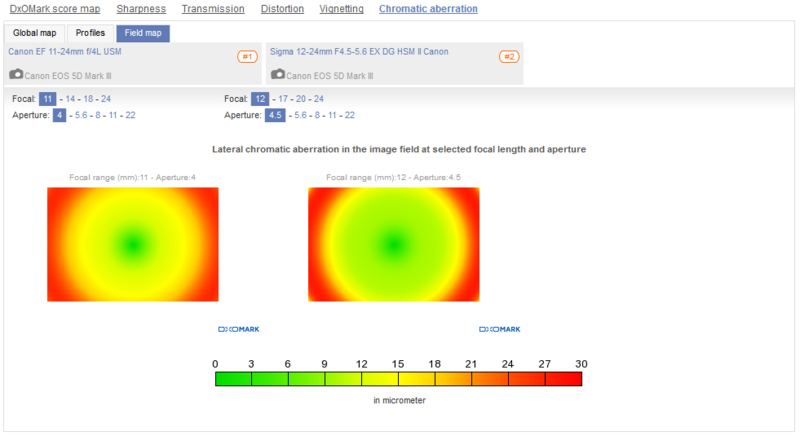 Given the slower maximum (variable) aperture, measured at T5.2-6.6, higher distortion (+2.0 to -0.5 %), and higher chromatic aberration (albeit very similar in character), this is somewhat disappointing. Vignetting is also higher: at 24mm, it’s lower than the Canon at 12mm, but that’s not surprising, given the difference in maximum aperture. It shows just how far Canon has raised the bar, but you do have to put it into some kind of perspective — and at around $1,400 USD, the Sigma is less than half the price. It’s about half the weight as well. In this section we compare the new Canon 11-24mm with the highly-regarded Nikon 12-24mm f2.8G ED, and we’ve elected to do so with it mounted on the Nikon D3X rather than on the D810, as the sensor in the former is closer in resolution to the EOS 5D Mk III. This lowers the ranking slightly, as the D810 sensor obviously records more data and raises the P-Mpix (Perceptual Mpix) score. 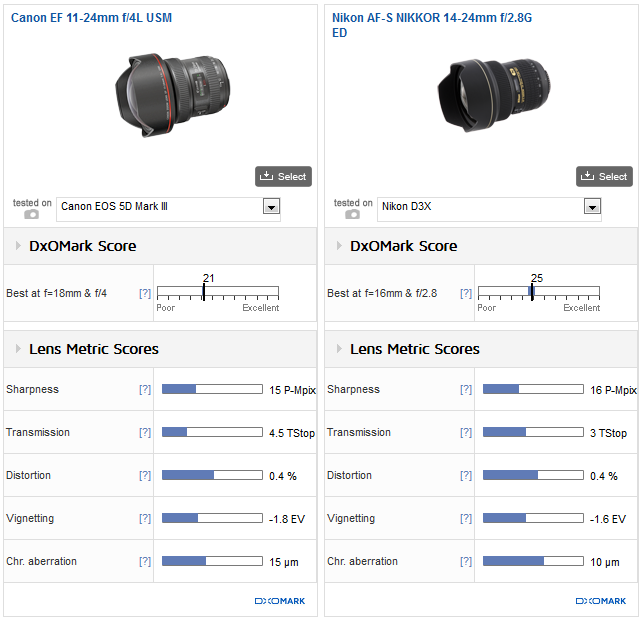 Overall the Canon and Nikon are closely matched, but it’s important to bear in mind just how much wider the Canon is and more demanding that is on bolstering image quality. The Canon has similar sharpness wide open at 11mm as the Nikon has at 14mm at f2.8, and that’s true throughout the zoom range. This is quite an achievement, although the Nikon is ahead across the field slightly when stopped down. 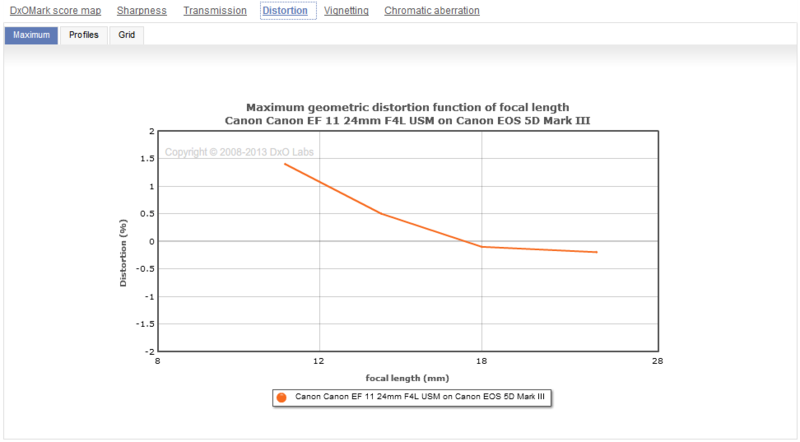 Distortion is lower on the Canon over most of the overlapping focal lengths, but the Nikon has marginally lower CA (with very similar characteristics) and lower vignetting, and it’s around $1,000 less — and that’s before any discussion about the larger maximum aperture. While traditionally strong in its telephoto lineup, Canon has always been rather weak in offering a range of ultra-wide-angle lenses. When introduced a few years ago, the EF 8-15mm f4L USM Fisheye zoom helped redress the balance, but it didn’t go far enough. Now with this new lens, Canon has proved it can compete with its long-term rival Nikon as well as with new challengers, such as Sigma, who offer some very specialized models at accessible prices. Sure, the EF 11-24mm f4L USM lacks the fast f2.8 aperture of the Nikon, but Canon traded that for wider coverage and didn’t make any concessions with image quality. Even the price is relatively accessible.